We discussed all the new demands on your time when you start a small business. These will continue to evolve as the business develops. We’ll cover how time allocations will develop over time, and the key importance of planning for these upcoming changes. As your business develops there will be changing demands on your time – it’s therefore important that you maintain balance while growing, otherwise you could find that things start to go off course if something has been let go. Many times I have seen people who work hard on marketing and are getting good results, but they then start to reduce their marketing to concentrate on other areas. With the delayed timescales in marketing results this can cause a problem. Things are busy to start with, from earlier efforts, but then it starts to get quieter and suddenly the business owner wonders where all the enquiries disappeared to. You need to make sure that you continue your marketing even when you are busy, to ensure you stay that way. Your marketing plan will help you, from the diary you will know what marketing efforts to make and when – time booked in the daily diary for marketing efforts will also help. For example, in the early days of my business I didn’t know much about social media, so I blocked out an hour a day in the diary to focus on it. Within a few years I was actually winning a regional award for my business use of social. All you need to do is ensure that you are allocating consistent time to your marketing goals and soon you will be achieving results. 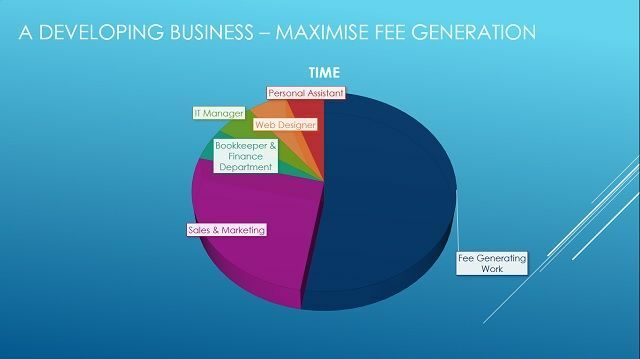 Your goal is to make sure all areas of the business are covered, while maximising the fee generating work you do, and also outsourcing less profitable areas. You need to be always aware that things can become unbalanced if you aren’t paying attention and actively planning.